If It's Too Loud...: Kristin Hersh - "Breathe In"
Any time we can bring you new music from one of Kristin Hersh's projects is an exciting time for us all. With an album upcoming later this year, Hersh has released a new single off it, "Breathe In." One thing we know from "Breathe In" is that the new album won't be one of her quiet acoustic releases. The track is dripping with what sounds like a tremelo effect on the guitar. When it doesn't have the effect, the guitar has a distinctly crunchy feel, and just about every element of the song, including Hersh's voice, has it's turn to distort. The song has a hypnotic and not entirely pleasant feel, although it's not entirely unpleasant, either. You can listen to a rough mix of "Breathe In" below. The song features Fred Abong of Throwing Muses on bass and Wyatt True (aka Hersh's son) on drums. The new album from Kristin Hersh, Possible Dust Clouds, will be out later this year via Fire Records. 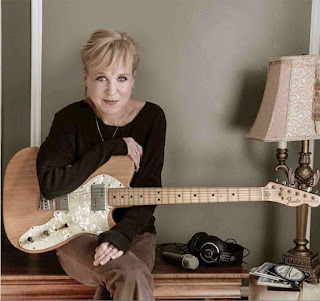 For more on Kristin Hersh, check out her website. Current tour dates are below the song.